What is Source Oriented Reinforcement? I think the most defining statement of Source Oriented Reinforcement is ‘Suspension of disbelief’ – A popular phrase conceived by Outboard Electronics and their product Timax. Source Oriented Reinforcement is the process in which audio source on stage (normally actors) is reinforced sonically by changing the delay and levels to individual speakers so that the imaging is preserved – meaning that the source of the audio still appears to be the original object and not the loudspeakers. 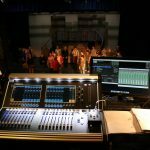 Panning is not involved at all in Source Oriented Reinforcement, mainly as this would only work for audience located in the centre of the theatre. Audience seated to the left and right would have differing levels from the L/R system and so no imaging would be preserved. More importantly, if an actor is situated to the right of the proscenium in a standard L/R system. They are a lot closer to the right speaker, than they are to the left and so sound from the actor will reach the right speaker well before the left. 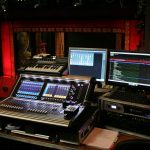 Using a cross point matrix or a product such as timax to manage delays between different areas on stage can vastly improve imaging and help the sonic environment. The precedence effect also plays a big part in localising sound on stage. If there is two sources of the exact same sound, the brain localises the the source that meets the ears first, but still combines the other sound to this, right up to 25ms after the first source. This means you can achieve a higher amplitude (up to 6-8db higher than the original sound) whilst still preserving the image and it seeming like the sound has come from the source. Between 1-10ms, phasing will happen between the source and the reinforcement. However between 10 and 25ms, because the arrival times are so greatly different, very few phasing issues will occur.